Guitarist Warren Haynes calls the new Gov't Mule album By A Thread "one of our strongest efforts yet," and one listen is proof-positive that this is no mere boast: from beginning to end, it's a gutsy winner, bursting with emotion and brimming with the kind of raw blues power that has been the band's calling card since their formation in 1995. From the riff-laden Broke Down On The Brazos (which features Haynes and ZZ Top's Billy Gibbons going toe-to-toe to wondrous effect) to the Hendrix-flavored Any Open Window (dedicated to the memories of Mitch Mitchell and Buddy Miles) to the shimmering Gordon James, a folk-flavored acoustic-and-strings number that turns magically psychedelic, By A Thread is a songwriting triumph for the Mule (which also includes drummer Matt Abts, Danny Louis on keyboards and rhythm guitar, along with new recruit, bassist Jorgen Carlsson, who replaces the late Allen Woody). Haynes is, of course, front and center, and the guitarist who was recently voted one of the '17 unsung Les Paul Legends' by MusicRadar readers, is in blistering form, dispatching screaming solos and singing with full-throated soul. 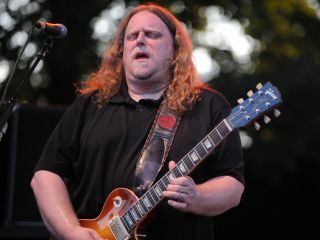 Gov't Mule are currently wrapping a US tour, and in March Haynes will join his other group, a little outfit called The Allman Brothers Band, for what has become a tradition, a residency stand in New York City. There is a twist, however: the 13 dates (beginning 11 March and ending on the 27th) will this time see the band play the United Palace Theatre instead of their usual haunt, The Beacon - turns out they were bumped by none other than Cirque Du Soleil (imagine that!). Even so, Haynes is looking forward to the Manhattan run of shows. "It's always a great time," he says. "Fans come from all over to see us play New York, and we're not going to disappoint." Last week, Haynes sat down to tell us whether he was more a Beatles man or a Stones fan, and now we present the second part of his interview, during which he discusses recording the new Gov't Mule album, recording with Billy Gibbons and his attitude towards practicing the guitar. By A Thread is your first album with your new bassist, Jorgen Carlsson. What was it like to record with him? "Jorgen's been with us about a year and a half. When we made By A Thread, he was still really new. We thought it was a good idea to go straight into the studio and kind of force our hand and see what happened. It was a wise move. "His contributions right off the bat were great. He has such an aggressive style and tone - he reminds us a lot of Allen Woody. But Jorgen's very much his own person and works great in the studio. We were all proud of the way things fell together in a nice way. That's not always the way it happens in the studio." Billy Gibbons plays on the opening track, Broke Down On The Brazos, which sounds like an old-school ZZ Top song. Did it sound like that when you wrote it, or was that the result of Billy's playing? "I've been friends with Billy a long time. I called him and sent it to him and said, 'Hey, what do you think? You want to play on it?' He called me back and said, 'Yeah, let's do it.' It was really important to me that we were both in the studio playing together, so a couple days later we were squared off with two Les Pauls, trading guitar licks. From that point forward, it turned into what you hear now. He did an amazing job. It was perfect for him, and he put his personality all over it." Did you guys rehearse, or was it spontaneous? "It was really spontaneous. Billy listened to the song a lot of times before we went into the studio together, and he had great ideas. It really came together so quickly. We spent about 30 minutes doing that recording aspect, trading licks and all that stuff, and then we were done. We were grinning ear-to-ear at the progression of it." The second song, Steppin' Lightly, is very emblematic of the album - it's got a deep R&B groove with a gritty rock vibe throughout. What were you listening to when before you went in to make this record? "That's a good question. I'm always listening to an abundance of old music, whether it's blues or jazz or rock or folk music or soul music. It can be anything from the last 35 years. "Steppin' Lightly came about in the studio. We started jamming on that groove, and that riff came about and we started jamming on it. Somebody would come up with one part and then another part, and then we started putting them all together - just kind of taking our time in an old-school way. "For us, it was a very different way of working. I tell people all the time that maybe we get one song that way in the studio, but it's very rare that we get three or four." By my count, maybe 60 to 70 percent of the songs are your own compositions and the rest are attributed to the band. The songs in which all four members contribute writing-wise, did they come about through jams, or did some of the members come in with riffs or half-finished songs? "It varies. Danny and I will write a lot together. Sometimes we'll write on the bus, sometimes we'll get together during the time off, or we'll get together at my apartment or in an old rehearsal studio. "Sometimes Matt will put ideas on tape and send them to me and that will get the ball rollin'. Every song is different. I showed up with a handful of songs I knew I wanted to record and a bunch of ideas that weren't finished yet. But I think the open-mindedness of thinking, Let's see what we can come up with as a band is what led to the spirit of this record." "I'm mostly a Gibson guy. The main guitars I played on By A Thread are my signature model Les Paul, this three-pickup Firebird that I played on Any Open Window and Steppin' Lightly, my '61 ES-335 - those are the main guitars." Tell me about the song Monday Mourning Meltdown, which to me seems political in nature. Do you think twice about introducing politics in your work? "Well, A) our songs have always had political connotations. From the very first record you had Mule and World Of Difference; and B) a lot of people tend to interpret that song [Monday Mourning Meltdown] in a similar way to what you're saying. "I think we experimented and got some great sounds, and they're not just my normal sounds I would typically use." "Monday Mourning Meltdown is not a political song. From my standpoint as the writer, it's about an individual - not a politician, not a character, not someone famous; it's written about someone in my life. I think maybe the fact that there's words like 'Patriot Act' and 'blood on the battleground' makes people think that it's a political song or that it's about George W. Bush, but it's not. Those are just metaphors for life." But it's about someone that you know? Which leads me to probably my favorite song on the record, Gordon James. I love the acoustic guitar with the orchestrations. Is Gordon James a real person? It seems like you're trying to talk to someone. "Gordon James, on the other hand, is a political song. It's not about one individual; it's a composite character based on many real individuals that we all know and hate. Gordon James is a war profiteer. You can pick your favorite war profiteer and slide him into that scenario and it'll pretty much work. "I'm really pleased with the way it turned out. Musically, it's coming from a folk-song perspective, but we were able to give it a Pink Floyd-ish backdrop or maybe a David Gilmour solo album backdrop that helps intensify the story." Guitar-wise, what are you proudest of on By A Thread? Anything you can point to as a breakthrough? "A lot of it. The stuff like Steppin' Lightly and Any Open Window where I'm playing this Firebird - that's a different sound for me. And Inside Outside Woman Blues #3, where I'm played not my '61 335 but a Custom Shop 335 - the sound we got in the studio was tremendous and very inspiring. "I think we experimented and got some great sounds, and they're not just my normal sounds I would typically use. Of course, the stuff with Billy is just off the hook." What kind of practice routine do you have? "Well, up until a few years ago, I never put the guitar down. But I've been touring so much that when I finally get a break, when I get a few weeks off, it's kind of nice to not play. Sometimes that means when you start back playing you've got all this fresh music in your head, but physically to get it to your fingers is a different story. "You have to maintain your chops and your technique. Usually for me, that's not a problem because I'm playing all the time. But if I stop playing for several weeks, it takes a few days to get back in the swing of things." In March you're going to do your yearly New York City residency with The Allman Brothers Band. Traditionally, special guests drop by - any idea of who might show up this year? "Well, it's a little early for that, but I think we're going to continue the tradition of getting a bunch of people to join us. Last year was the 40th anniversary and it was totally off the hook. But it was a blast for everybody involved, so continuing that is the logical choice." Two years ago, you guys missed playing New York when Gregg got pretty sick. Did you think at the time that it could be the end of the band? "Well, Gregg's spirits were high then. He knew that he had to deal with the Hep C treatment, but he had a great attitude about it. We were all very proud of him for going through something that we all hope and pray we never have to go through. But I think from his standpoint he couldn't wait to get back in the swing of things." And he's doing good now?